Storm water drains in particular become clogged with silt over time causing localized flooding when it rains. Ironically the solution is more water, but driven through our high pressure water jet at up to 4,000 p.s.i. to clear out all the debris and flush the drains through, returning them to full bore operation. Household waste (“foul”) drains benefit greatly too from cleaning in this way, as they can be greatly reduced in diameter and efficiency by the build up of grease and scale. In older properties there is only one combined drainage system for both household waste and storm water, potentially doubling the problem. 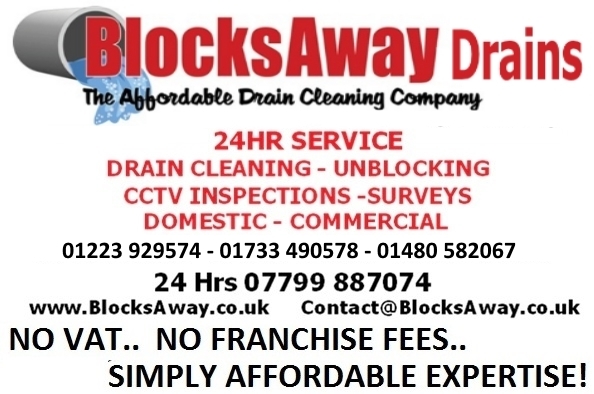 Don’t flush away your hard-earned money, use Blocksaway Drains, the affordable drain cleaning company, to clean those troublesome drains. Contact us to arrange a call out. We cover Cambridge, Huntingdon, Peterborough, throughout Cambridgeshire and beyond.